CAREER: Born into a family of musicians, Charles learned to play the trumpet at a very young age and began winning awards while attending Fatima College where he was the first three-time winner of the Provincial Cup, as well as the youngest student ever to win it. Growing up in Trinidad, he also learned to play the cuatro and steelpan. At Florida State University, he studied with jazz pianist Marcus Roberts and was named Brautlecht Scholar of the College of Music. 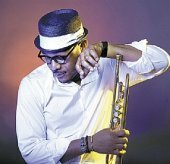 In 2006, Charles won the National Trumpet Competition, Jazz Division, in the USA and later released his debut album "Culture Shock." In 2008, Charles was awarded the William Schuman Prize upon graduating from the Juilliard School of Music. He also attended the Henry Mancini Institute in Los Angeles, California, USA, and gained invaluable experience appearing on stage with musicians such as Wynton Marsalis, Monty Alexander, Gerald Wilson, Roberta Flack, Frank Foster, the Count Basie Orchestra, Maria Schneider, Johnny Mandel and Benny Golson. He formed his own touring and recording band and released his second album "Folklore" in 2009. In 2011, he began teaching at Michigan State University's College of Music as an assistant professor and released his third album "Kaiso" that year. His fourth album, "Creole Soul," was released in 2013.